Are your walls safe when you open your sofa bed? Most Futon Frame conversions require you to pull your sofa bed out from the wall and close to the center of the room, so the back can be lowered without hitting the wall. That can require two people, and if you’re not careful you can scuff or damage your wall. Solution? Strata Wall Hugger Futon Frames! This design is easy to open because the back stays flat against the wall, saving your walls (not to mention your carpet or floors) from unnecessary wear and tear. This collection is crafted from quality imported hardwood. The frame is part of our Carriage Collection and comes in our Warm Cherry, Dark Cherry or Natural* finish. The Denali, like all Strata frames, utilizes our Wall Hugger™ technology. The slats are slightly rounded giving this frame a strong yet elegant look. 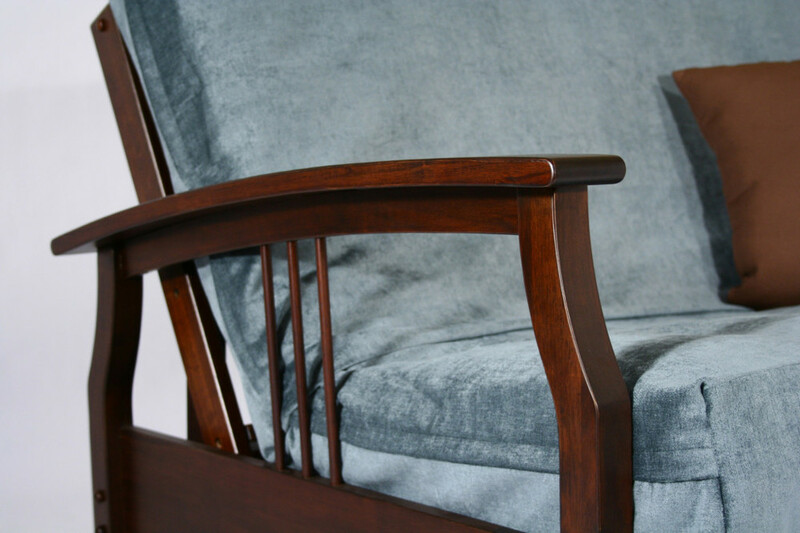 This great armless frame is part of our Carriage Collection, and is crafted from quality imported hardwood. The frame is a wonderful space-saver and comes in five finishes: Warm Cherry, Natural*, Black Walnut, Dark Cherry, and Painted Black. The Dillon, like all Strata frames, utilizes our Wall Hugger™ technology. The Dillon is our solution to your space problems! The Fremont is made from our quality imported hardwood and of course utilizes our Wall Hugger™ technology. The Fremont comes in two finishes: Dark Cherry or Black Walnut. The Fremont’s unique curves and delicate design make this frame a wonderful addition to any room.